When it comes to our students, safety is first. Our transportation team takes seriously their task of safely delivering your most precious cargo to school and back home again. Student transportation is a privilege—not a right. The bus driver has full charge of the students when they are riding the bus. The driver will report student misbehavior to the principal. 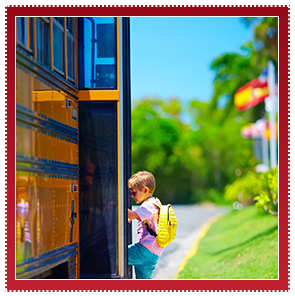 Continued misbehavior could result in the loss of the student’s qualification to ride the bus. Careless or reckless behavior not only endangers the student but also the safety of others on the bus and on the road. The driver is in full charge of students when they are riding the bus. Students must obey the driver promptly. Students should never stand in the road while waiting for the school bus. Students shall not get on/off the bus or move about within the bus while it is in motion. Students must not extend their hands, arms, heads, or bodies through the windows. Students must not open or close windows without the permission of the driver. The driver will not permit distracting conduct including fighting, loud talking, or foul language. When approaching a railroad crossing, riders must remain quiet until the bus is safely across the tracks. Students must stay out of the driver's seat and must not tamper with the equipment. Students should cooperate with the bus driver in keeping the bus clean. Students will be courteous and obedient to the driver.